I hope your week has been going well for you. It's been a busy one for me and all the talented Designers over at Peachy Keen Stamps as we share our projects showcasing this month's new stamp release. If you missed these gorgeous "Christmas in July" stamps, you can see them all HERE. I love gingers and this little couple is just too Sweet! 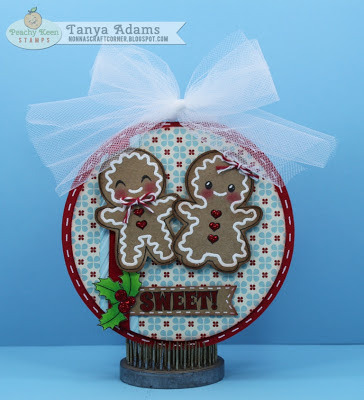 * I stamped the gingerbread body images onto kraft paper and cut them out. * Next I stamped the icing image onto each body with Versamark ink, covered them with white embossing powder and used my heat gun to get a shinny look. * Each ginger got a bit of red Stickles and a sweet twine bow. * After putting everything together, I added a big tulle bow for the finishing touch. Thanks so much for stopping by today - I hope you enjoyed your visit! OMG! How sweet is this! Love gingers too and these two have stolen my heart!! I love this card. What an awesome stamp set. Too cute. Love the papers and those cute little ginger's. OH My Goodness!!!! This is absolutely adorable!!! I LOVE it!!!! Way too cute!! I can't wait for my stamps to get here!! Eek!!! Tanya you did a fantastic job with the sketch! Love your gingers, papers, and that giant bow! OMgosh this is just so Adorable. I love them!!!! Oh how adorable!!! Super sweet!!! Totally Cute & FUN!! Love it!! Your ginger couple is so super cute Tanya! Love the tulle bow too! Total cuteness my friend! I love it:) I am just finishing up a Christmas card and it seems a bit strange when its sunny and 75 out! I am loving all the inspiration from the Christmas in July challenges out there so maybe I will keep making more, lol!! Will need them all eventually ha? Hope your having a great day! Awesome card Tanya! This is super adorable!!! What a GREAT set of new stamps and the papers and embellishments are just perfect!! Great stamps and you make the most of them. Adorable. Sweet card!! These little gingerbread are adorable! !